Fill 3-quart saucepan two-thirds full of water; heat to boiling. Empty pasta mix (from Suddenly Salad box) into boiling water. Gently boil uncovered 12 minutes, stirring occasionally. Drain; rinse with cold water. Shake to drain well. In large serving bowl, stir together seasoning mix (from Suddenly Salad box), sweet-and-sour sauce, mayonnaise and sour cream. 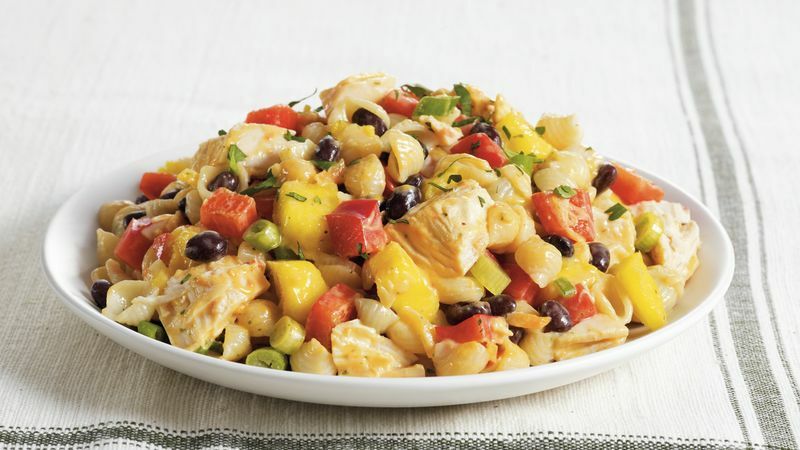 Add chicken, mango, bell pepper, onions, beans and cooked pasta; toss until evenly coated. Sprinkle with cilantro. This salad can be prepared ahead of time, but refrigerate the dressing separately. When you’re ready to serve, just toss together! To peel and cut a mango, use a sharp knife to score peel lengthwise into fourths; peel like a banana. Cut peeled mango flesh lengthwise close to both sides of seed; chop flesh.